Potatoes and cauliflower are universally comforting. While usually relegated to the side of the plate, these starchy stars deserve a chance to shine as the main attraction. Despite being chock full of nutrients, the time they take to prep and cook don’t always make them an obvious choice for a quick and easy meal. But as you’ve probably noticed from my other recipes, shortcuts abound, and are often more budget-oriented than you would expect. Frozen vegetables are my number one time saver. Often cheaper than fresh, and arguably better for you since they are usually frozen within hours of being picked, they come pre-cut and ready to use within minutes. Another favorite are those pre-cut refrigerated potatoes found by the eggs at the supermarket, which are almost always on-sale, or at least reasonably priced when they aren’t. There’s no washing, peeling or cutting involved and unlike cauliflower, I think the texture is better than that of frozen potatoes. Combine these time-saving veggies with the warm, fragrant flavors of northern India, and you have the makings of a rich, flavorful meal in no time at all. 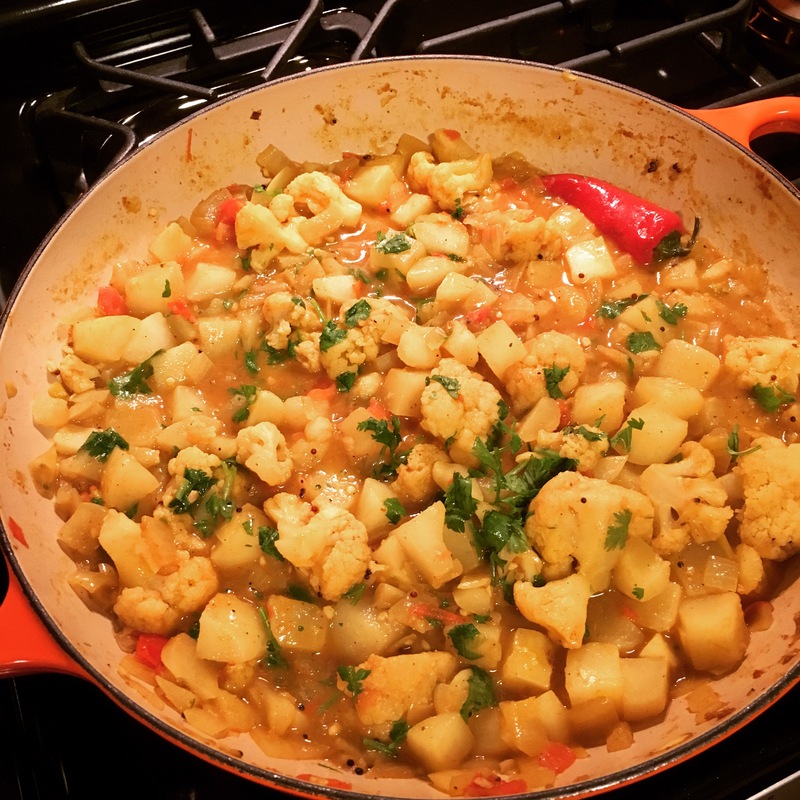 To help bulk up the meal, curries such as this aloo gobi, are typically served with bread or rice. Many mainstream grocery stores now sell naan bread and other Indian breads in the bakery or freezer section, making them easy and accessible. If you’re thinking about rice, click on this link to check out my recipe for easy, baked Brown Rice. Or you can whip up some traditional basmati rice in a little over 20 minutes, about the time it takes to make this delicious and healthy aloo gobi. Warm the butter and oil in a saute pan over medium-high heat, add the mustard seeds and cook until they begin to sputter. Next, reduce the heat to medium and add the onions, the serrano/jalapeno pepper and a pinch of salt and cook for about 5 minutes, until the onions begin to soften, stirring occasionally. Add the garlic and ginger, cook for a minute or so until fragrant. Stir in the spices and let cook another minute or two, the mixture will be paste-like. Add the tomatoes and half the cilantro next. When the tomatoes begin to soften, add in the potatoes and cauliflower, coating them with the spice mixture. Finally, stir in the water. Raise the heat to high until the liquid is bubbling. Cover and reduce heat to medium, cooking 15-20 minutes until the potatoes and cauliflower are tender. Add more water if needed. Stir in the remaining cilantro, then serve with rice or Indian bread and nosh!